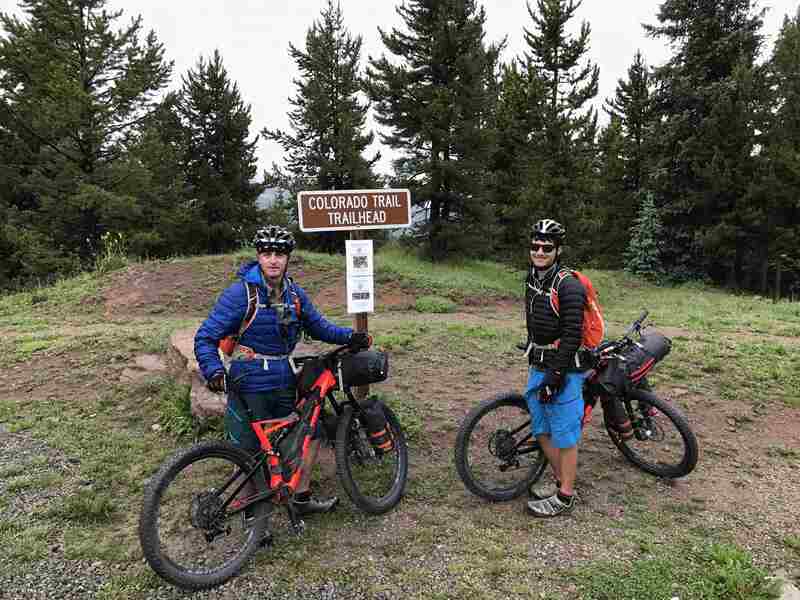 On day 15 we hoped to make it to Durango and finish the CT, but weather again conspired against us. We started on the side of Hermosa Peak. We had a bunch of climbing to do past Blackhawk Mountain. Up to this point we hadn’t seen any big wildlife. I had hoped that we might see a bear, but no such luck. However, on the descent from the pass a marmot got between Kyle and me within the trail gully and ran for several feet before darting off trail. It was pretty funny to both of us. I got the action on the video below. We kept pushing to get to Durango by end of day, but the predictable afternoon thunderstorms got us. At one point we had to get all our head-to-toe rain gear back on. That included our fancy green dishwashing gloves which worked really well at keeping our hands dry. The 3pm storm let up around 4pm, and we again got on our way. But near 5pm another was brewing, and since we needed to climb back up to 12,000 ft on the exposed Indian Trail Ridge, we decided to call it a night. We had one more night with beautiful views. Wildflowers, wildflowers, wildflowers. The downside of doing the CT in July is the predictable clouds that gather every afternoon and become major thunderstorms which leave the trail a muddy mess. But the big upside is that wildflowers are abundant, particularly at the highest elevations. We started the day bright and early at 7am at Little Molas Lake on the pass, but the weather looked dire. It was cloudy and misty, and I hoped that it would burn off. It did – mostly. As the sun rose, it became clear how pretty this segment would be. Huge views and meadows of wildflowers for the entire day. This was another day of big climbing up to a saddle at 12,500. The views became more stunning as we ascended. Finally we hit the summit at noon. We had a huge downhill in front of us and were excited to get back on the bikes. As we descended we came upon a group of young women setting up camp with their horses. It was so Colorado. By 4pm we had luckily avoided rain, but the sky was getting dark with thunderclouds, so we decided to park at the base of Hermosa Peak for the night. We ended up near a stream on the side of a rock fall. I got no sleep that night as every so often a big chunk of rock would tumble down the mountain and scare the s*^t out of me. But at least we had a great view out of the tent again. The pièce de résistance of the CT is the San Juan mountains, and we got deep into them on day 13. The views were simply stunning, one after another. Physically, it was a tough day. We had to make up time lost from weather on the prior day, and 20 miles of the riding was bouncing (4000 ft) between 12,000 and 13,000 ft. But the final descent of over 3200 ft from Stony Pass down into Silverton put huge grins on our faces. We made the right decision to stay put in the fog the night before and enjoyed a great sunrise. By 8:30 am we made it. We continued on the path toward Bent Peak. Then we started up toward Carson Peak, and ran into through-hikers John and Sarah from Denver (they had passed us in the fog the night before). Their water system failed that morning and they were boiling water stream-side. They had at least a day or two before hitting Silverton. I believe in trail karma, and since Kyle and I both had Sawyer Squeeze systems, I gave them mine, and they were so thankful. The positive karma worked out too, as even though it got really dark and grey, we didn’t have any rain for the entire day. We then continued our climb up the valley below Carson Peak. At one point we heard a huge group of coyotes crying. In the next valley we came upon Cataract Lake. At about 3 pm we ascended the final climb of the day up to Stony Pass. We heard a huge herd of sheep on a distant mountain all bleating their brains out. It was a cool sound to listen to. At Stony Pass, we cyclists have to get off the CT because the Weminuche Wilderness is protected, and I was prepared to be disappointed riding the road down into Silverton, but I was wrong. It was a wicked fun and steep descent through huge wildflower meadows with stunning views. CT hikers don’t get to see this, but I’m so glad we did. We’ll come back and hike the Weminuche some year and have the best of both worlds. We have come 350 miles and ascended 60,000 ft. We get back on the trail tomorrow, and have only four segments left. We started the day on the Spring Creek trailhead off highway 149 with the goal to get to the high point for the Colorado Trail at 13,271 ft. But weather became a problem as a huge thunderstorm hit just as we were to climb a big rock outcropping, and then dense fog settled in. We spent much of the day climbing and hike-a-bike on really rocky and muddy terrain. As we ascended, we had to ride through a rocky plateau that was really difficult. We ended up hiking much of it. At noon we reached 12,600 ft and a big rock outcropping. We wondered if we had to climb it, and then saw other bikepackers coming down from high atop. At that point the first big clap of thunder hit. We knew we weren’t going higher anytime soon, and we pitched our tent as fast as possible. The other bikepackers going east did the same thing. The wind shook the tent violently, and I hoped and prayed that we were low enough to not get struck. After a few hours the rain stopped, so about 3pm we packed back up and headed up the rock outcropping. The views with mist lying low in the valleys was spectacular. After we got to the top of the outcropping (and it was a difficult hike-a-bike on scree) it flattened out a bit and we started a gentle descent. Then the fog rolled in around 3pm. Since we were on this trail for the views and photos, we decided to park for the night. I figured it would clear up overnight like traditional Colorado “monsoon season” weather in July. At 5pm the fog dissipated a bit, and I contemplated getting back on the trail, but Kyle was comfortably in the tent watching his Youtube videos, so we just stayed put. I stepped out to take more pix. 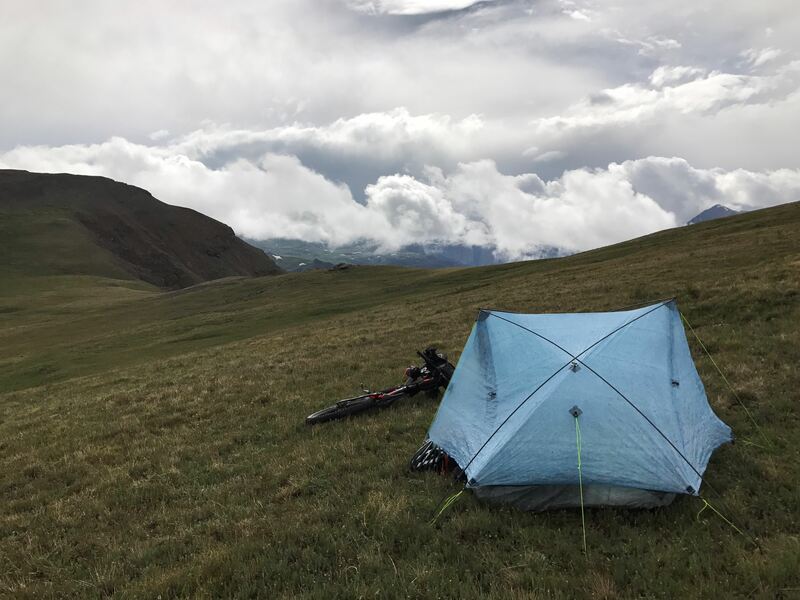 It was a really windy night at 13,000 ft. At one point, the sustained wind had the tent collapsed on both of us, but the minute the wind stopped, the tent popped back into shape. I have to say I really like this ZPacks Duplex. It’s weathered big winds and rain almost every day, and we’ve been dry. However, the winds did keep us up for most of the night. The 11th day of the CT would also be short. Our primary mission was to get to highway 114, where Cris would be waiting with burgers, fries and sodas to shuttle us into Gunnison for a two day break. She’s so good to us! We awoke on Sargents Mesa to a spectacular sunrise. On the trail we came upon several fearsome mountain creatures. At the final summit for the day we bumped into through-hikers Xi, who just finished his degree at University of Denver and was doing the CT before returning to Beijing, and Cassidy. We had met Xi at a stream the day before. When we met Cris at the highway, we picked up two through hikers, Emily and Zachary and their dog, who were also headed to Gunnison before returning to the CT. I pity poor Cris – we had been on the trail for days and were really ripe. She had all the windows down for the whole 45 minute drive down. We get back on the trail tomorrow, and hit the highest point of the CT at 13,000+ ft. The views of the San Juans get even more epic from this point on. Day 10 up to Sargents Mesa was short. For most of the day we battled bowling ball sized rocks in the trees. We both were tired from all the rock hopping and climbing and wanted to kick back, relax and enjoy the scenery. As we climbed up to Sargents Mesa, the lightning and thunder became more ominous. 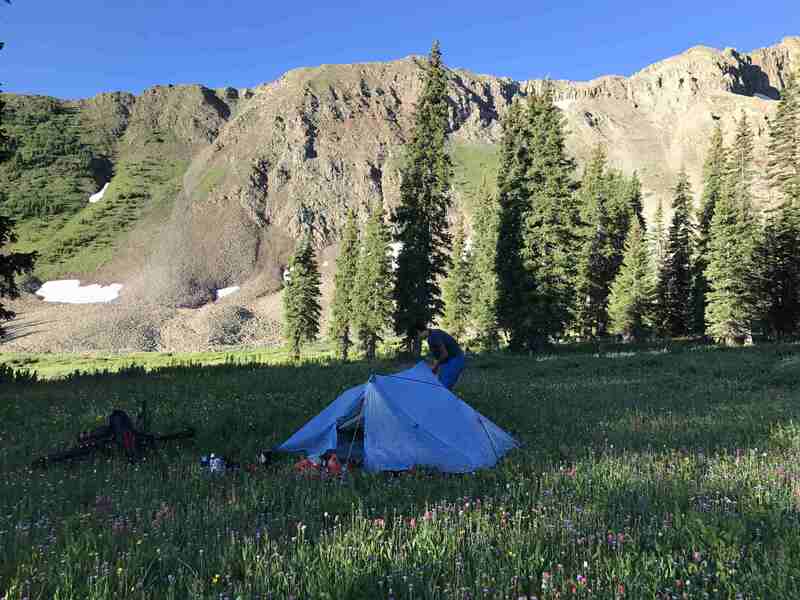 The top of the mesa is near 12,000 ft and exposed, so we pitched the tent near a stand of trees. We saw a few more intrepid CT hikers pass us as the thunderstorm grew. After it passed, I set up my hammock and just kicked back to enjoy the view. Up on the mesa is a war memorial called Soldierstone, constructed in the 90s with private contributions organized by a retired US Army soldier named Stuart Allen Beckley who served during the Vietnam War. Soldierstone is an odd memorial – not well marked, not near any major parking, on top of a mountain mesa, honoring foreign solders who helped US Forces. I finally found it after looking for about 30 minutes. It was particularly solemn with the silence and dark clouds of next thunderstorm approaching. As I walked back to the tent it started to rain. It rained almost all night. As much as day 8 was “meh”, day 9 up to Marshall Pass was the exact opposite. We had an huge climb (5200 ft over 24 miles), experienced a crazy small-world situation on the trail in the middle of the forest, rode along the Monarch Crest at 12,000 ft as a huge thunderstorm grew and then dumped on us, met cool through-hikers from San Diego, and helped a poor guy who shattered his shoulder mountain biking. Despite all the rain, it was an epic day. yes, those are kitchen gloves, and they work! We awoke on the side of Mt Shavano, and headed down early in the morning to cross highway 50. Most of the day would be climbing up to Monarch Crest. A bit of backstory – in early June I bought new Specialized Stumpjumper bikes to ride the CT. Shortly after we got them, I searched for bags that might fit in the frame gap, but found none. So then I searched for a custom manufacturer and came upon Greg Hardy at Rockgeist in Asheville, NC. After I sent him a cardboard pattern, he was able to build two bags for me fast – about a week. They are great high quality bags, and have withstood lots of mud, 60 mph wind in the bikes on top of the car, and frequent zip/unzips as the packs store most of our food. When I got them, I sent Greg a pic showing how well they fit into the frame. He was happy and told me he too was doing the CT from Durango to Denver in July and that we might see each other on the trail. I thought the chances of that were remote with the breaks we were taking, the reroutes, etc. I was wrong. We had just bumped into Greg in the San Isabel forest in the middle of nowhere! So we took a bunch of pix of his work. Just as we were about to depart, four mountain bikers came down the same path, and stopped. One of the guys says, “Ed?” I say, “Yeah?” And he responds, “It’s Nick.” It was Nick Thelen and friends from Colorado Springs up for the day doing just this segment! Nick is the guy whom I consulted with to prep to do the CT, and also who advised I get the Stumpjumpers. What a freakin’ small world! We took our pix and got on our way. The wildflowers were strong on this segment. After a tough day of climbing, the summit was in sight, but the final stretch was on an even steeper slope. But we didn’t have time to stop for long, as a major storm was on the way. We got on our bikes and proceeded to climb up Monarch Crest. I was a bit nervous as lightning and thunder got bigger, but we didn’t have many options – we had to get down to Marshall Pass. This is what we had been working toward for days. The video below really captures how pretty the area is on top of the world. As we descended we met up with through-hikers Ethan and Lannie, two more really cool people from San Diego. We would see them several more times in the coming days. We continued our descent, and then came upon two guys from Houston walking their mountain bikes down. We asked if they were ok, and one said, “No, I think I’ve broken my shoulder.” We discussed how we could help, and settled on the following. First, we gave them a sling and Ace bandge we had in our med kit (Kyle and I took a NOLS Wilderness Medicine class in March and were prepared). Second, I’d text them using my InReach, and if I didn’t receive a response in a few hours, would call 911. Third, Kyle and I would go down and see if there were any cars in the Marshall Pass parking lot and ask for help. We got going, and then the skies opened up. For the first time, we had to put on all of our rain gear mid-day. When we got to the parking lot we found two kayakers from Sedona, AZ about to leave. I explained the situation, and they hung out for an hour until the Texans came down, helped them get their bikes onto their cars, and then headed down to the hospital in Salida. Such great people in the mountains! I got a text back from the gentleman with the shoulder issue – he in fact had completely shattered it. I’m still amazed at his pain tolerance and composure. We finally settled down and pitched tent in a cow pasture. It seemed that the rain had re-hydrated every damn cow pie in the whole field, and I stepped in several. But it was a good day. We got back onto the trail on Sunday the 16th in the middle of the Collegiate Peaks with the goal of getting to Highway 50. We got close, camping below Mt Shavano. By the time we quit we had climbed 5000 ft over 28 miles. It wasn’t an overly exciting day – in fact Kyle said it was strictly “meh” as we were in the trees for most of the day. We did emerge from the forest on occasion for some good views, but we both were anxious to get up high and see the big views that the CT promises. One of the things Kyle and I like most about the CT is that we’re meeting some really cool people. 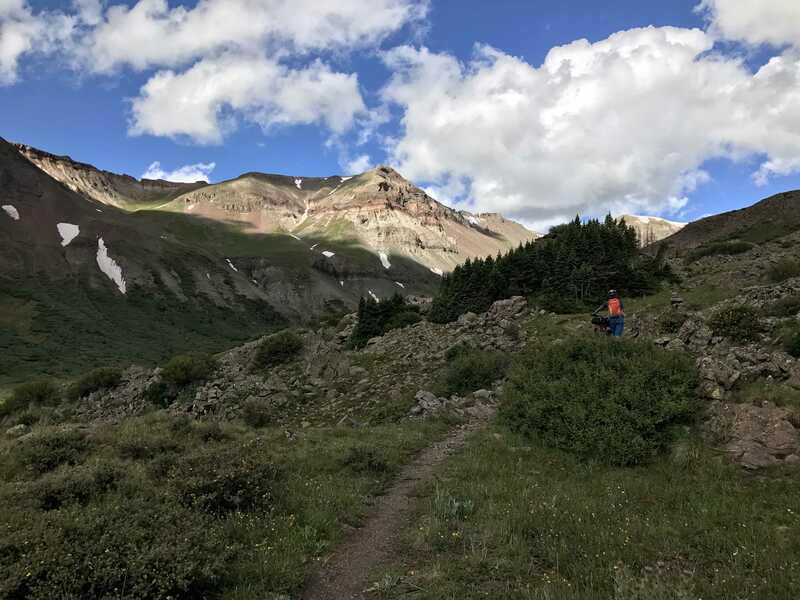 Hiking the Colorado Trail attracts an eclectic mix of people of all ages. When we pass hikers on our bikes we always stop and talk with them about what direction they’re hiking, when they started, where they’re from, etc. Hikers are usually curious about what we’ve got in our packs. The one consistent thing we’ve found is that everyone is upbeat and happy to be out on such a beautiful trail. And depending on how fast you are, and how many breaks you take, you usually bump into these same people over multiple days. Then you are able to catch up on what happened in the interim. Lately that has been primarily about how much rain we’ve gotten and how soaked we are. We stopped for the day on a relatively flat spot near the Shavano camp ground. Day 7 was much better than the prior day. We woke early with the mission to make up lost time and get to Buena Vista, where Cris would pick us up for a few days of downtime. We got on the road around 7am and headed out of Leadville toward the mountains. It was cold (in the low 40s) and misty from all the recent rain. Finally we made it to the Mt Elbert trailhead. We found many downed trees on this segment. Later in the morning the mist finally lifted, and we took off our jackets. We then descended down to Twin Lakes. At Twin Lakes we met Jay and Renee. Renee is solo bikepacking the whole trail and is the only other CT bikepacker we’ve met so far. I hope we’ll see her later on the way to Durango. We stopped to rewater and take a few pix. Then we got back into the forest and started ascending the last climb of the day. We were both running on empty. Finally we hit the summit, and shortly after came out of the trees for a spectacular view. At the bottom of the trail we met up with several other thru-hikers who had watched our fast descent. And there I had two bars of cell coverage and called Cris to pick us up. We then headed to Salida for two days of again sitting on our butts. We are now half way through the CT! 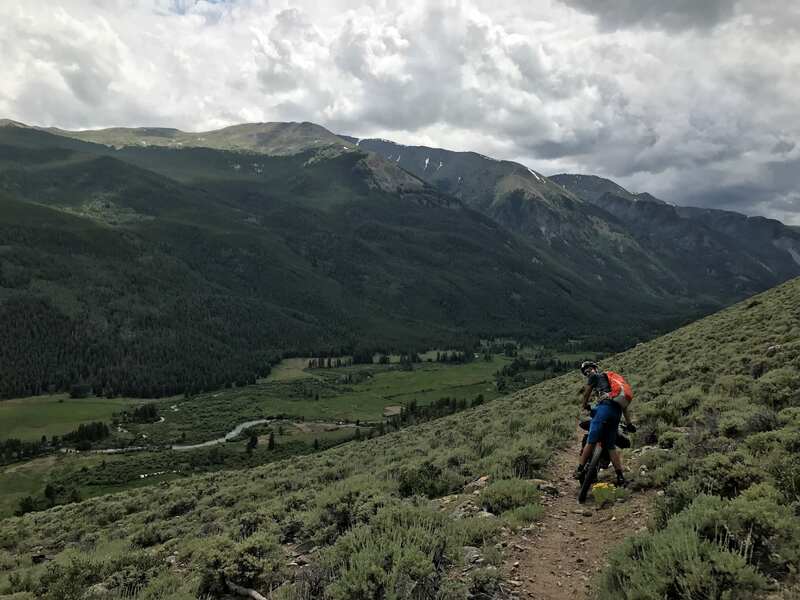 We’ve traveled 210 miles, climbed 25,750 ft in elevation, and descended 23,500 ft.
We head back onto the trail for three or four days on Sunday, and from this point on it gets really remote, but holds the most epic views and mountain biking.